Trump called O'Rourke a "stone cold phony." Cruz is confronting a strong challenge from O’Rourke, an El Paso congressman who has set fundraising records in pursuit of becoming the first Democrat elected to statewide office in over two decades. Trump happily played the role of attack dog at the rally, which fell on the first day of early voting. Speaking before Trump, Cruz returned the praise, pledging his support for Trump’s own bid for another term in one of the senator’s biggest applause lines. 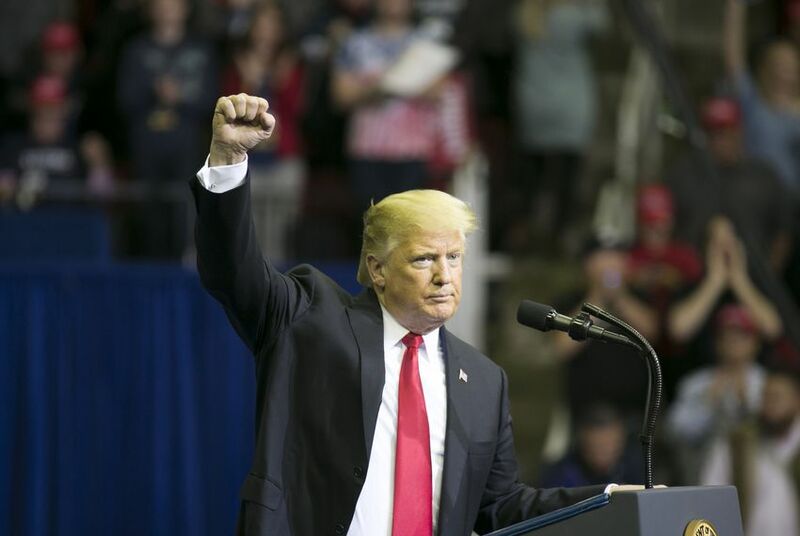 Trump kept the compliments flowing throughout the rally, where he credited Cruz, a member of the Senate Judiciary Committee, with having recently shepherded through the nomination of Trump's embattled U.S. Supreme Court nominee, Brett Kavanaugh. At one point in the process, anti-Kavanaugh protesters confronted Cruz and his wife while they were eating at a Washington, D.C., restaurant. "Ted, you probably saw, did a beautiful job of staring down an angry left-wing mob in our recent Supreme Court battle victory,” Trump said. Cruz was not the only Texas Republican who basked in Trump’s praise at the rally. The president also doled out shoutouts to a series of other statewide officials and congressmen, notably one who was not there: U.S. Rep. John Culberson of Houston, who is in a tough re-election campaign against Democrat Lizzie Fletcher. Trump also urged support for another endangered Texas congressman: U.S. Rep. Pete Sessions of Dallas. Trump acknowledged the money flowing into that race as well and claimed Sessions is “still leading” against Democrat Colin Allred. Even before Trump took the stage, the 18,000-seat arena was nearing capacity with a long line of supporters still gathered outside. Several speakers said Monday that there had been some 100,000 requests for tickets at the event, which was moved to a larger Houston stadium after demand seemed poised to exceed capacity at the original location. Gov. Greg Abbott, the first speaker of the night, asked that full arena to “keep Texas as red as the MAGA hats you’re wearing tonight.” U.S. Sen. John Cornyn situated that fight within the context of Republicans’ broader battle to protect their majorities in both houses of Congress. “My friends, make no doubt about it: Texas is the firewall in this midterm election,” Cornyn warned. The sign-waving crowd also heard from Lt. Gov. Dan Patrick, who traveled to Washington, D.C., in July and asked Trump to visit Texas to get out the vote. Like other Texas Republicans, Patrick wasn’t short on criticisms for Cruz’s Democratic opponent. “Beto: Border Enforcement Totally Optional,” Patrick said to raucous cheering. O'Rourke was also in Houston on Monday, making several stops throughout the area to lead groups of supporters to the polls. At his first stop, shortly before polling places opened at 8 a.m., O'Rourke was swarmed by supporters as he made his way to their meet-up point in a strip mall parking lot. "This is an extraordinarily beautiful day," O'Rourke told the group of early risers, speaking through a megaphone. "Look at this sky. It's cool, it's fall — we're gonna vote. Listen, we've all worked for a very long time to be here at this moment together." Speaking with reporters on the eve of Trump's visit, O'Rourke downplayed its impact on the race, saying, "I don’t know that Texans care too much one way or another what someone from outside of Texas thinks." The Texas Democratic Party struck a similar tone in a statement Monday, saying it "won’t let Trump distract us, because we know the job at hand — it’s time to get out the vote!"